When “A” gave this to me to try, I was not only excited, but honored to partake in a review. I thought I’d try to give a slightly different perspective on the drink, so I gave my whole family the opportunity to try it out and let me know what they thought. 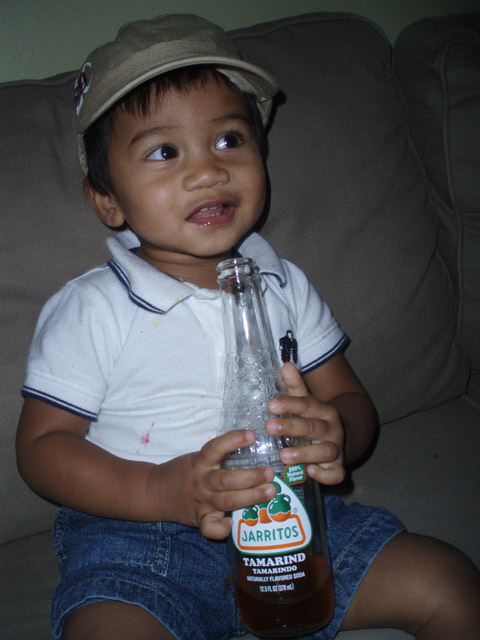 So without further ado, here’s my family’s take on Tamarind Jarritos. I made sure to chill the bottle for a few hours before trying it. My wife says my steel stomach can tolerate anything, but nothing upsets my stomach more than a warm soda. I open the bottle, after a much to do in locating the bottle opener, and let it breathe. I like to treat my soda like a fine wine. Not really, but I figured it couldn’t hurt. Before I let the tasting commence, I take a sniff. Not really much of a tamarind scent. First to try it out was my four year old daughter. I poured some into a small glass tumbler and she took a sip. She liked it. She told me it was sweet and wondered if she could have her own bottle. She was of course bummed when I told her this was the only one. My two year old girl was up next. I poured her a glass and she took a taste. She didn’t mince words. Next was Little O. He’s one, so his vocal communication skills aren’t all there, but his actions spoke for itself. He grabbed the bottle from my hands and almost finished it all. I was able to wrestle it back to have enough for my wife and me to try. I hand the bottle to my wife and she takes a taste. I read her initial reaction as confused. Then she said that she could tell it was tamarind, but it was watered down. It was good, but for her she needed a stronger flavor to come through. Finally I take my turn. I have to agree with my wife. Not because I have to…ok, most times I have to…oh ok, I have to, but this time I was given the unique chance to express my own opinion. So here’s my moment to say whatever and what do I go and do? Agree with my wife. Though I will say this in addition, I feel as though the tamarind flavor is distinguishable enough that it shouldn’t taste like anything else but tamarind. This drink definitely made me guess. So what’s the final verdict? Well, if you’re getting it for the kids, definitely buy a pack. One, they won’t care whether it has enough tamarind or not and two, they won’t have to fight over one bottle. For the rest of you, definitely buy a bottle…and enjoy! How can you NOT want to buy this soda?